Upcountry South Carolina advertises that it is all about “mountains, mills and memories”, and well it should, nestled as it is in the foothills of the Blue Ridge Mountains, tight against North Carolina with its western reaches defined by the Chattooga and Tugaloo Rivers that flow from the mountains into the Savannah River, and on to the Atlantic Ocean. Within Upcountry boundaries lie Pickens, Oconee and Anderson Counties, Lakes Jocassee, Keowee and Hartwell, and the scenic highways of the Cherokee Foothills and Savannah River. 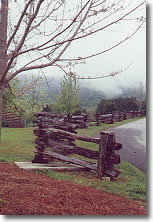 While Upcountry’s north-west area is defined by Sumter National Forest, its lower reaches extend into the red clay belt that is shared with the state of Georgia. Upcountry Tourism represents 85,000 acres of gorgeous South Carolina territory which includes thirteen state parks. The area is intersected east to west by I-85 which is the fastest way to reach Upcountry but not the most scenic or historic route to drive. A tour of Highway #11, the Cherokee Foothills Scenic Drive reveals a great deal about the area’s heritage and history. Driving from east to west, afficionados of the Revolutionary War should stop at Cowpens National Battlefield. It was here that Daniel Morgan of the Continental Army and Banastre Tarleton of the British forces collided in a decisive battle in a former pasturage. It was also here that the 71st Highlanders fought a valiant battle on the side of the British. The Visitor Center has an informative media presentation and an excellent display of mannikins costumed in c1780's uniforms, a good reason for those of Scottish blood to visit as the distinctive uniform of the Highlanders is well portrayed. Down the road, the town of Chesnee’s main street is atypical small town southern U.S.A. with its hardware, drug stores and locally run businesses like “Lightning Lube and Lather”. 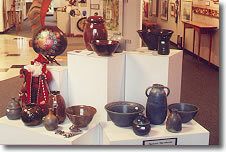 Chesnee is home to the Carolina Foothills Artisan Center where artisans from both North and South Carolina are represented, their work chosen for display by juried process. 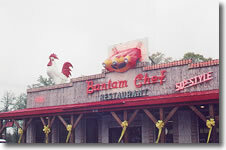 Bantam Chef, a jewel of a themed eatery lies just off the main street. 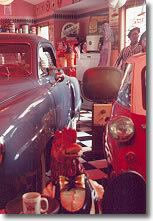 Bantam Chef’s theme is 1940 - 50's with great displays of memorabilia including a full-sized BMW Isetta and Studebaker. Decorative touches include model car and license plate collections, a black and white tiled floor and 1950's style booths. The menu is “in keeping” with the theme. You’ll recognize the restaurant by its banty rooster sign and front end of a Studebaker mounted outside the former garage building. Along Cherokee Foothills Scenic Highway, you’ll find a number of interesting attractions such as Strawberry Hill U.S.A., with its fields of U.S. Flags, restaurant and store themed in red-white and blue, right down to tables, chairs and floor. Here you can find local foods such as cans of beef tripe, hominy sauce, Scuppernong Jelly and other South Carolina favourites. Peach, apple and pear orchards are found along this particular stretch of highway, sheltered by the mountains which begin to make themselves known in the distance. There’s nothing prettier than mist lifting off mountains on a rainy day. A number of fruit stands, including Mountain Fruit Farm, offer fresh in-season produce. Watch for waterfalls, Pumpkintown Mountain Opry, spectacular views of Table Rock and Aunt Sue’s Country Corner, a cluster of specialty shops and restaurant, in a mountain village setting. If you’re lucky, and 80% of the time, you will be, Phyllis Cannon will be playing tunes on a console organ on the front porch. If you tell Phyllis your favourite song, she’ll play it for you, perhaps sing it too. What’s the most requested tune? - “Nothing could be finer than to be in Carolina in the morning . . . .” Lunch at Aunt Sues is a real treat with lots of local specialities on the menu. If you order a cream cheese and olive sandwich, ask your waitress to add a couple a strips of crisp fried bacon to give it some crunch. Mmm good! If Carmel Coyote ice cream is listed, try it. Upcountry communities, just waiting to be discovered, include Sunset, Tamassee, Walhalla, Seneca, Clemson, Norris, Pendleton, Liberty, Pickens, Fair Play, Star and Honea Path - to name a few. Many town names associated with the area are Indian in origin - “Cherokee” means “Quiet Stream” - “Tamassee” means “Knob” - “Oconee” means “Water Rising in the Hills”. The town of Walhalla, founded by the German Colonization Society out of Charleston in 1850, boasts a wide main street lined with good examples of heritage commercial architecture. Walhalla translates in the “Garden of the Gods” for those of Norse persuasion. German heritage and culture is celebrated with the community’s famous “Oktoberfest” which is held mid-October each year. “Santa” resides at Country Store Antiques on Main Street. Drop in for a Ho Ho Ho. Walhalla is the sort of place where the locals drop into the paint and wallpaper store for a spot of relaxation in a few stuffed chairs set out just for them, where everyone knows everyone, where folks are friendly, and kind toward strangers. 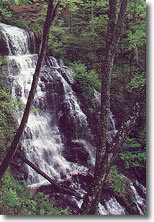 Upcountry has many interesting attractions, one of the most unique being the Stumphouse Tunnel and Issaqueena Falls near Walhalla. 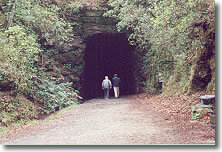 Stumphouse was to be one of three tunnels that would ultimately allow a rail line to run from Charleston, South Carolina to Knoxville, Tennessee. Workers, who for the most part were Irish immigrants, worked six days a week, twelve hours a day to push a tunnel 5,863 feet through the hard granite rock of Stumphouse Mountain. The tunnel was to have run 236 feet below the highest point on the mountain. With a cut-rate of only 200 feet per month, the best that could accomplished before money for the project ran out in 1859, was 1,600 feet into the solid, unforgiving granite. Today, you can visit the Tunnel and Falls which share the same property. The tunnel retains a constant 50 F temperature with 90% humidity. The walk to both Tunnel and Falls is easy and well worth the effort. Don’t forget good walking shoes, camera and lots of film. 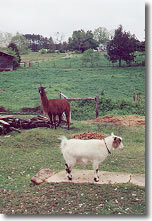 Plan a visit to the Upcountry area around several events in and around the town of Pickens. 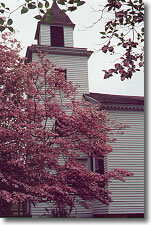 Haygood Mill holds “Milling, Mountains & Memories” on the 3rd Saturday of each month. Folks donate their considerable skills for fund-raising to maintain the center piece, a c1845 mill with its overshot wheel. The property has, besides the mill, a heritage barn building, log cabin, still-on-the-hill. Each month, all kinds of old-time activities take place during this great, spontaneous event. Musical groups such as “Nick and the Nick Pickers” and “Fiddlers Three” entertain. There are animals to enjoy, good food, old time “pickin’ and singin’”, traditional crafts, mountain men with their unique vehicles and best of all, no admission charge. 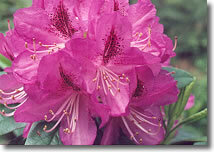 On the 3rd Saturday in April, the popular Azalea Festival doubles Pickens population of 5,000. This event has great local flavour with good music, food, crafts and some of the friendliest people in the U.S.A. to chat with. 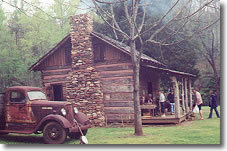 Pickens also boasts the largest flea market in the south which is held every Wednesday, rain or shine year-round. For those interested in family research, Pendleton has an extensive archives. 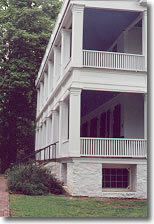 Two plantation houses are open to the general public near Pendleton, c1825 Ashtabula - built by Lewis Ladson Gibbes and “Woodburn” c1832 built by Cotesworth Pinkney as a summer residence. No visit to Upcountry is complete without a visit to the 288 acre South Carolina Botanical Gardens which are located on the grounds of Clemson University - in the city of Clemson. Right next to the Botanical Gardens, you’ll find the Fran Hanson Discovery Center, housed in a former Southern Living Showcase Home and the Bob Campbell Geology Museum. Second floor displays in the Discovery Center often have exquisite examples of heritage quilts. Campbell’s Geology Museum comprises an amazing collection of rocks from around the world. Check out the museum’s “black room”. Rocks lit was ultraviolet light are amazing! One of the Botanical Gardens most unique features is a nature-based sculpture area. Plan to spend the better part of a day visiting these three attractions. The Upcountry area has ample opportunity for outdoors activities. With its lakes, mountains, unique flora and fauna, waterfalls and white water rivers, there’s something to please all enthusiasts. Oconee State Park, Devils Fork State Park, Table Rock State Park and Keowee-Toxaway State Park & Cherokee Indian Interpretive Center are four of the best known areas for outdoor activities. 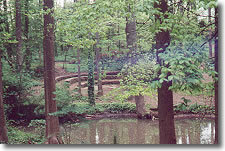 Most offer camping, fishing, picnic areas, trails, swimming nature programs. Some rent rustic cabins, canoes and fishing boats. While in northern South Carolina, other attractions worth visiting are the Hatcher Garden and Woodland Preserve in Spartanburg, a little east of Upcountry, a ten acre public garden which offers ponds, walking trails, gardens of perennial and annual flowers, shrubs and native woodlands. Admission is free. Tours are self-guided. Down the road from the Gardens, The Beacon Drive-In beckons at 255 John B. White Sr. Blvd. Drive into the lot, stay in your car, blow your horn and an attendant will come to you. Better still, go inside, get in line and watch the action as staff hustle your order - and hustle is the word here. The Beacon is famous for its iced tea - “world famous” they claim. If you order their meals “a-plenty” beware! Servings are huge. Specialties include chicken liver plate and chilli cheese burgers. Breakfast is served from 6:30 a.m. - the house specialty being country biscuits, ten different ones are listed on the menu. 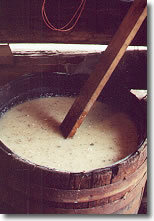 Traditional bacon and eggs breakfasts are served with two biscuits, grits and peach halves. Their most famous dessert is “Pigs Delight”, a banana split for six hungry folk. There are plenty of places to stay in the Upcountry. Highly recommended are the White House B & B, in Blacksburg with its charming rooms and sumptuous breakfast, Sunrise B & B, near Salem where you can enjoy a cottage or room in the heritage home and c1840 Liberty Hall Inn in Pendleton with its wide columned porches, tastefully decorated rooms and “Café Leisure” a full service restaurant. Looking for unique and interesting places to eat? Try Café Rendevous in the town Seneca on Ram Cat Alley with its great intact c1920's art Deco commercial architecture. The Café serves excellent food in unique surroundings, one of the most notable a two storey wine rack that requires a ladder to access. Entrees include Lobster Ravioli, spicy crawfish etouffe, crab cakes, spicy marinated Portobelo and great crusty bread. Before starting out on any trip, be sure to contact the appropriate tourism office for a comprehensive package of area information. Always make accommodations arrangements in advance, especially during busy tourist seasons. While in the state, watch your speedometer as speed limits are strictly enforced. Have a great time! White House Inn B & B.